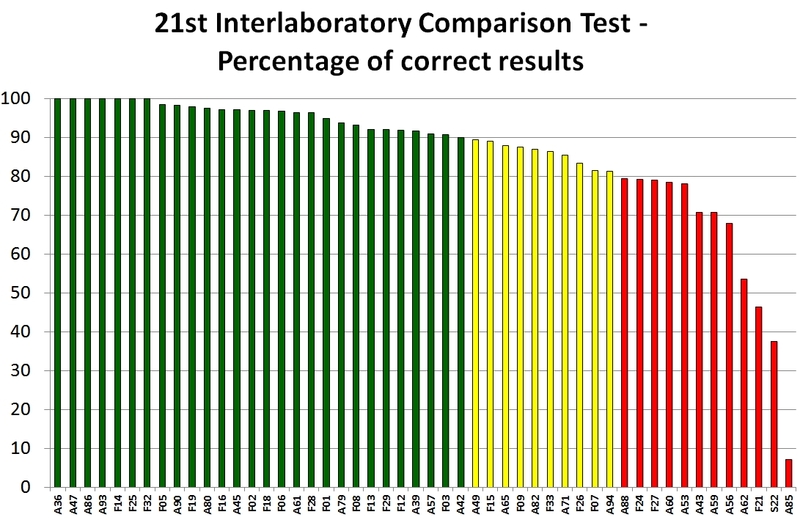 52 laboratories in 24 countries participated in the 21th Needle/Leaf Interlaboratory Test, but only 50 laboratories submit results in time. Sample 1 was collected and prepared from Mr. Peter Waldner and his employees in Switzerland. Sample 2 and Sample 3 were collected from Mr. Walter Wuggenig and his employees in Austria/Arnoldstein. Sample 4 was collected from Mrs. Katharina Keiblinger in Austria/Klausen-Leopoldsdorf. Special thank to all colleagues for collecting and preparing samples for this ringtest. A88 (79.5%), F24 (79.2%), F27 (79.0%), A60 (78.6%), A53 (78.1%), A43 (70.8%), A59 (70.8%), A56 (67.9%), A62 (53.6%), F21 (46.4%), S22 (37.5%) and A85 (7.1%). The laboratories A39 (As), A56 (C), A60 (S), A62 (Ca), A82 (K), F07 (As, Cr) and F21 (Ca) failed with the same parameter in the last test. Therefore, their QC/QA-problem or/and their methodical problem is still not solved! All interested laboratories are invited to take part in the re-qualification program up from now till 1st of September 2019.